Handling and installing your ink cartridges the right way isn’t rocket science, but it can help save you money and keep your printer happy and healthy. A couple simple steps taken when replacing cartridges make a huge difference that results in better print quality and longer lasting ink, as well as preventing annoyances such as printer head clogs. Pre-installation handling of your cartridge. Before you install a new ink cartridge into your printer, be sure to inspect it. Gently shake the cartridge or tap it on a hard surface a couple times to prime the ink. Ideally, you want to do this BEFORE you remove the protective tape. Otherwise, you’re at risk of spilling ink all over the place . . . a messy and costly flub. Your next move depends on the type of cartridge you’re installing. Most cartridges have a plastic pull tab that will cover the vent hole or a plastic clip that is protecting the cartridge while it’s in its packaging. Not every cartridge will have a clip or tab, but if they do it’s important to remove them before you try installing your ink. Be cautious around the gold contact or connection point on your cartridge when installing. These points of contact are crucial for getting accurate readings on your ink levels and making a good connection with your printer. They are also easy to scratch and won’t work well when covered in ink residue or dust. If you see dust on this gold chip, gently wipe it clean with a Q-tip or lint-free cloth. Before you try to install your ink cartridge for the first time, be sure to reference your instruction manual. Every printer is different and improperly installing your ink cartridge can damage the printer, your cartridge or both. If your printer didn’t come with a manual or you’ve misplaced it, more often than not you can find a PDF version available for download on the manufacturer’s website. More popular printer models will often have a tutorial video available on the brand website, YouTube, or any number of tech savvy blogs. When installing fresh ink into your printer, go slow and be careful. 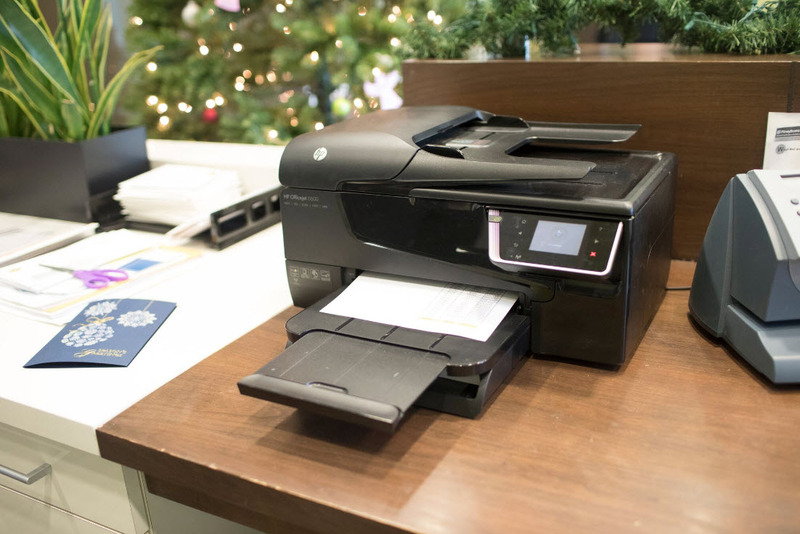 Keep installed cartridges from drying out by using the power button to turn off the printer. Wait until the power button is completely off before unplugging the unit. This allows the printer head to return to its resting position, which will help you prevent damage to the printer. If your business prints a lot, chances are you’ll want to have some ink cartridges on hand in reserve. Storing cartridges is easy, so long as you follow a couple basic rules. First of all, keep cartridges in their sealed packaging. Removing them from the airtight packaging they are shipped in will cause them to dry out. The nozzle on your cartridge can crust over and ink can drip out of the chamber. Cartridges should be stored somewhere dark and relatively cool, such as a closet or cabinet, until it’s time to install them. If you have an opened cartridge, reseal it as best you can to keep it in good condition for when you need it. Place it nozzle side up in an airtight container, and if you have the protective tape or clip reapply it before storing. To help prevent drying out, place a damp paper towel next to the cartridge in the container and store it in a cool, dark place. Check on the cartridge periodically to make sure the paper towel hasn’t dried out. How do you know when your ink is running out? Most printers today are armed with technology that accurately tracks the amount of ink left in your cartridges. This comes in the form of a blinking light or notification on the LCD screen adorning your printer. Other equally obvious signs are when your print quality goes down, resulting in streaking, missing colors, or blank pages. Before you toss out your cartridge, you should always double check to make sure there’s not something else going on. Quite often, your cartridge still has adequate ink left in it. If you haven’t used your printer in some time, the ink in your cartridge may just need to be reprimed. Prolonged inactivity can cause the ink to settle, which makes it more difficult for the printer to access. Prime the cartridge, wipe it clean, and try again. Wet a paper towel with warm water and blot the cartridge with the printhead side down. The printhead is located on the end of the cartridge. It looks like a gold or copper strip and is where the ink exits the inkwell. Be careful not to mistake the print head with the gold or copper contacts or dots, which are where the printer interacts with the cartridge. Ink doesn’t come from there, so if you’re blotting and there’s no ink . . . you very well might be dabbing the wrong part. After blotting the printhead with the damp paper towel, hold the cartridge against a dry paper towel for about thirty seconds to a minute. This process wicks out dried ink that may be clogging the head. If your printer uses individual color cartridges, such as the HP 564XL series for example, the paper towel method won’t work. Instead of an integrated printhead, this type of cartridge uses individual cartridges that pop into a printhead built into the printer. While this is an effective method for getting high grade prints, your printhead can collect up microscopic dust, air bubbles, and dried up ink that will clog it up over time. The easiest way to clean your printhead is using a machine designed to clear the ink nozzles. Many printers have an integrated printhead cleaning mode, too. Check your user’s guide to find out if there’s a cleaning process built into your unit. If your test print still isn’t up to par, try running the process again. Tips to prolong the life of your ink cartridges. Print early and print often. It may seem counterintuitive that printing more leads to saving ink, but when it comes to waste this is one of the more important factors. Printing with regularity keeps your cartridges primed and ready to go, lowering the likelihood that your ink settles. This will also prevent the ink in the nozzle from drying up and creating clogs. When printing articles or emails, print in draft mode. This uses less ink per page and will actually print faster than regular mode. Unless you’re printing something for presentation, don’t print in the highest quality mode . . . this is designed for producing high resolution images and text for only special occasions, as it requires a lot of ink (and prints at a glacial speed). Don’t run the cleaning mode too often. Cleaning your printhead is important to prevent clogs and maintain the quality of your prints. Running a cleaning when there aren’t any major issues may seem smart for simple maintenance, but it requires a lot of ink to flush out the heads and run test pages. Always keep your printer loaded. Even when you aren’t printing in color, keep all the cartridges loaded. Open spaces on a built-in printhead introduce air into the unit, which will dry out the cartridges you use over time. Even an old cartridge that is empty or nearing empty is better than leaving a gap. When it comes time to dispose of old cartridges, don’t just toss them in the garbage! Ink cartridges are made from valuable resources and they can be easily recycled. Visit Earth911.com to find the nearest recycling location to you. Just search by zipcode, and you are all set! Ninety percent of ink cartridge and printer care is knowing where to start. Keeping up with regular maintenance helps you get better quality prints for less money in the long run. When you turn these tips into regular habits, you will have a happier and healthier printer that will give you fewer headaches. Happy printing!